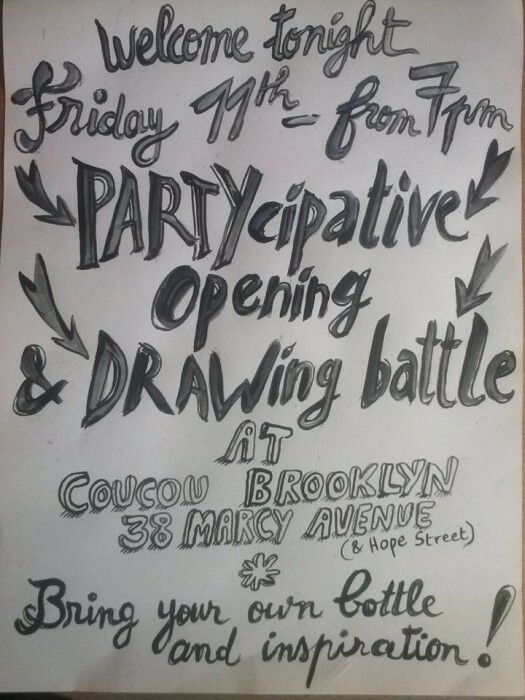 Join us for an interactive art exhibition at Coucou! Some of you will remember the linocut extravaganza we hosted last summer when Sara was in town, one of the first events we ever held at Coucou. A year later, Sara is back for more and will be exhibiting her latest works, including a series of exclusive portraits and drawings of New Yorkers Sara encountered during her trip! In addition, attendees will be encouraged to join in on the fun – there will be paper, pencils and colors on hand so people can draw each other, and the drawings will become part of the show. You can even come back and pick up your portrait when we take down the show at the end of the summer! Check out some of Sara’s drawings here. Also, this date marks the one year anniversary of Coucou’s opening – come celebrate with us, and stay tuned for further birthday celebration news!